Previous winner, Steve Knowles, with his mule deer from the Ultimate Mule Deer Hunt. When you enter Big Time Texas Hunts, you enter for a chance to win one of ten premium hunt packages while also supporting conservation. Big Time Texas Hunts is a conservation fundraiser, basically. We try to raise money that we can put directly back into wildlife conservation work on our wildlife management areas and all of our public hunting lands across the state. Justin Dreibelbis is Texas Parks and Wildlife’s program director for private lands and public hunting. 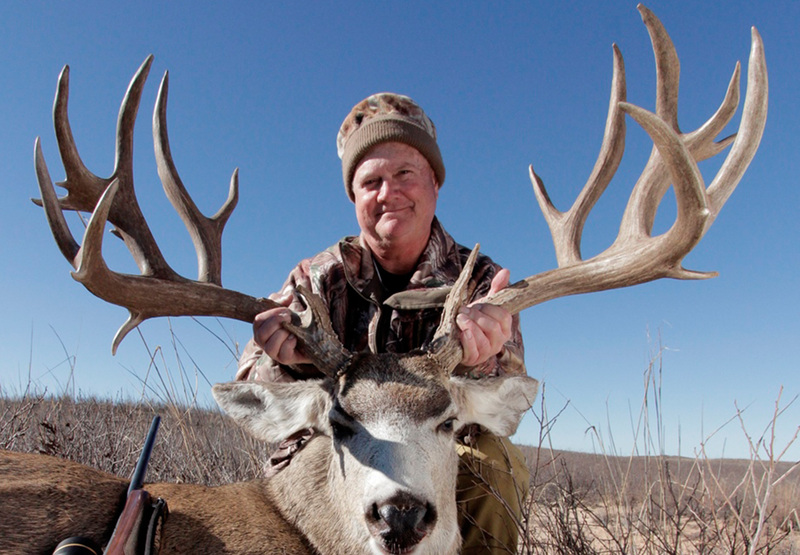 Big Time Texas Hunts includes 10 premium hunt packages for a wide range of game animals. The easiest way to buy chances for the hunt is to go onto our Texas Parks and Wildlife website and search Big Time Texas Hunts. There you’ll find opportunities for all 10 of these hunt packages. And you can buy as many as you want online; they’re nine dollars apiece. There’s a $5 online administration fee, but it allows unlimited entries in a single transaction. Right off the top every year, a portion of that money goes into our desert bighorn sheep program. It pays for surveys and a lot of that translocation work. We’re trying to put new populations in new mountain ranges in West Texas where they originally occurred. It also goes directly back to our Wildlife management areas for habitat projects. It includes all kinds of access improvements for our public hunters. So, it’s all going back to things that our public hunters care about. The deadline to enter Big Time Texas Hunts is October 15th. Find complete details on the Texas Parks and Wildlife website. This entry was posted on Friday, September 14th, 2018 at 12:00 am	and is filed under Big Time Texas Hunts, Events, Hunting. You can follow any responses to this entry through the RSS 2.0 feed. You can skip to the end and leave a response. Pinging is currently not allowed.